What is the magic of a sailing ship? Is it the freedom to slip quietly away from land to live simply in exotic ports of call for days, weeks, or even months on end? Is it the quiet grace of powerful sails pulling a mighty vessel through the wind and the waves? Or is it, just some romantic notion that sailing vessels are magical and cool? 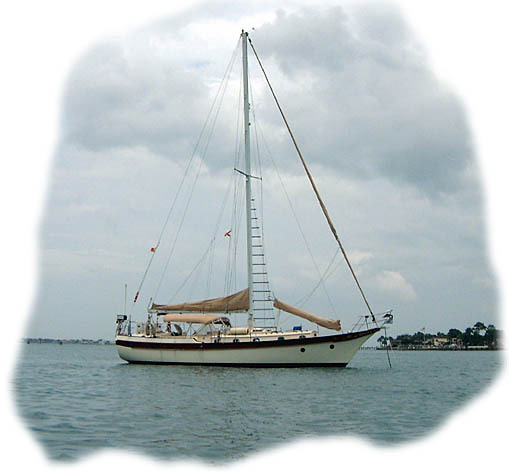 Shibumi is a 44-foot Caribbean Sailing Yacht (CSY 44). She was built in 1980 in Florida's Tampa/St. Petersburg area. CSY, during that era was primarily a yacht chartering firm. They decided to built their own ships when they could not get the quality they were looking for from other boat builders. The CSY 44 is one of several models built by the company. Jill and I like the CSY 44 because Shibumi is a center cockpit model that has a foward area with a main salon (living room), a forward vee-berth (guest bedroom), a head (toilet), and separate shower. Behind the cockpit is the aft-cabin (master bedroom) with its own head and shower. Also in the aft-cabin is the navigation table, very convienent to the cockpit helm. Shibumi is a Japanese term that has many meanings. It can mean "great refinement underlying commonplace appearances". It can also mean "a statement so correct that is does not have to be bold", or "understated beauty". But we like it most when the Japanese refer to Shibumi as "eloquent silence". Our dream of retiring and living by the sea became a plan. Our plan materialized into instant reality when the FAA, for which Jill and I both worked, decided to move our office from Atlanta, GA to Washington, D.C. That move gave Jill the option to take early retirement. I was already eligible to retire. We needed all of 3 seconds to meditate and fast on over our choices. I called it quits after 38 years of public service, Jill had 22 years. Things happened faster than we had planned. We have a house in Palm Coast, Florida that we planned to retire to, someday. Well, that someday was, all of a sudden, now; but the house was leased-out to a fellow from Pennsylvania for another six months. Our home in Atlanta sold quickly and we had to get out. Our only option was to put our things in storage and seek the 'eloquent silence' of Shibumi.